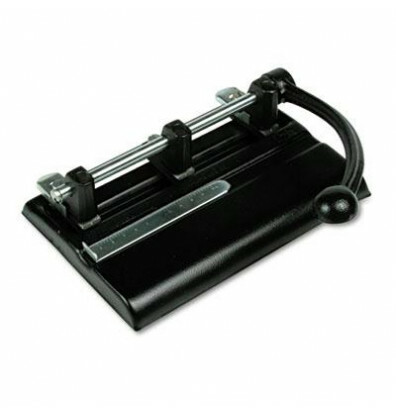 40-sheet three-hole/two-hole punch provides power handle leverage that lets you easily punch through up to 40 sheets of 20 lb. paper. Punches extra-large 13/32" holes. Adjusts for two-hole or three-hole punching. Accepts two to seven punch heads to punch two to seven holes. Extra punch heads sold separately. Punch includes adjustable ruled paper guide, margin depth guides, large paper chip pan and nonskid rubber feet.